My gardener (aka Ryan) has successfully kept our herbs alive despite frequent travels and high temperatures. This would probably be a good moment to interject with an aside about how blessed I’ve been to marry Ryan. Despite my complete refusal to do any and all yard work (hopefully my dad isn’t reading this because he did not raise me this way! I’ll blame the fact that I was basically mowing the lawn from the womb and am therefore burnt out on yard work), he loves me anyway. Oh, AND he spends hours working on our yard every week, which includes watering and maintaining the fresh herbs I insist on having. I’m spoiled, I know. Since Ryan works so hard on the herbs, I figure it’s my job to make sure they get used. I had planned to make a standard loaf of sourdough for use in paninis or whatever when I came across this recipe for a bread bouquet in my Always Superb cookbook. Round sourdough loaf? Check! Fresh herbs? Check! I immediately set out to make this, carefully slicing the bread so as not to cut through and divide into pieces. The next part was easy—mix melted butter and chopped herbs, pour into the crevices of the sliced bread, and top with parmesan cheese. 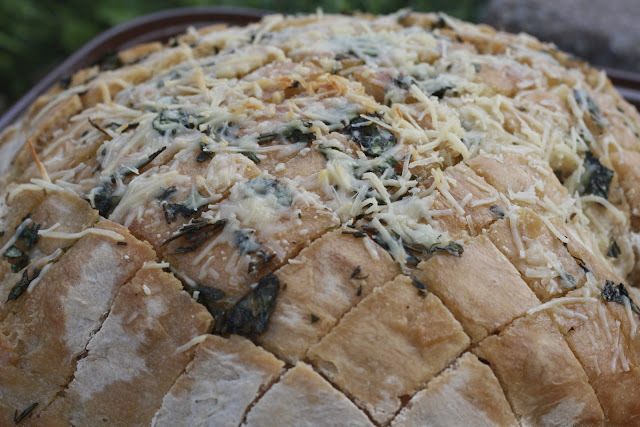 Wrap in foil, bake, and then break off pieces of warm buttery herby bread! 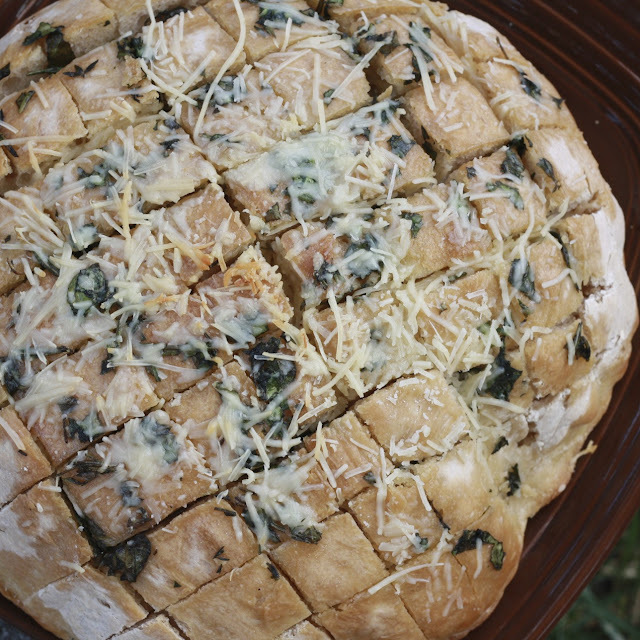 With an abundance of both sourdough starter AND herbs, I’ll be making this again and again this summer. My only change will be to use freshly grated parmesan (or perhaps another cheese altogether). I didn’t have the fresh stuff on hand and the pre-grated didn’t melt as well as I had hoped. Even so, there were no complaints from the six of us who tore into this, fresh from the oven! 1. Cut the bread into 1-inch slices stopping 1-inch from the bottom of the loaf. Turn the bread and repeat, forming a criss-cross pattern. Place on a large sheet of foil. 2. Combine the butter, herbs, and garlic in a small bowl, mixing well. Pour over the loaf in between the pieces of cut bread. Sprinkle with parmesan cheese. Wrap in the foil. 3. Bake at 350F for 10-15 minutes.